Don Aiello was introduced to lacrosse when two of his children started playing in Princeton Junction, NJ in 1997-2000. In the fall of 2003, Don, like a lot of other parents who are interested in supporting their kids’ endeavors, stepped up to become the “organizing team parent” of the very first boy’s lacrosse team in Davis to enable his sons and their friends to participate in this remarkable sport. Thus, started his active involvement in lacrosse, first locally, then regionally and eventually nationally with one driving focus – What can be done so more kids can play this great game? In 2004, Don incorporated the Davis Lacrosse Association and served as its President until 2011 and as a board member until 2015. During that time, the organization grew from one high school aged boys’ team to fielding multiple boys’ and girls’ teams from U9 through HS. In 2008, recognizing that the HS boys’ teams were ready for CIF participation, Don negotiated with the Davis School district to have both Varsity and JV boys’ teams added to their supported CIF sports. Don’s interest in lacrosse grew from table crew responsibilities to become a student of the sport, learning how to coach and officiate starting in 2008. He’s coached boys’ U9 through U15 teams and officiates youth and high school games, including first-round CIF playoff games. Expanding his role in regional lacrosse, Don served in various capacities in the Northern California Junior Lacrosse Association over a decade, first as the boys’ HS commissioner (2006-2007), then board member (9/2007 – 9/2008; 9/2009 – 9/2015), NCLJA President – (9/2010 – 9/2012), and even pitched hit as the Executive Director (Seasons – 2010 & 2016). During his tenure, Don had various accomplishments but is proudest that he helped clubs improve their operations and expand the number of USL trained coaches. He assisted numerous new clubs to prepare to join the NCJLA. Don wrote and continues to update, “Guide to starting and running a youth lacrosse organization,” which is used by local clubs, as well as US Lacrosse and other clubs throughout the U.S. In mid-2012, Don became a board member of the NorCal Lacrosse Foundation (NCLF), a US Lacrosse Chapter, and was elected its president in September, a position he still holds. During this time the NCLF distributed $55,000 in grants and loans to start up organizations, and player scholarships. When US Lacrosse changed the role for chapters in mid-2013, Don incorporated the NorCal Chapter of US Lacrosse that May and continues to serve as a board director and its president. During Don’s tenure as the President of the NorCal Chapter, the Chapter was recognized twice by US Lacrosse for outstanding contributions. Don received the coveted Homer R. Schwartz Chapter Leadership Award in 2017. Additional recognition for his contributions has come from the Northern California Lacrosse Association – Annual Jay Pearson Award in 2011 and US Lacrosse, Man of the Year– Sacramento Valley in 2013. In October 2015, Don, Laura Jennings and Marcos Amezcua established a women’s umpire committee and assigning organization under the NCCUSL to ensure that the NCJLA and other CIF leagues would have trained officials for their games. Since Chapters typically do not support officials’ organizations directly, Don incorporated the NorCal Women’s Lacrosse Officials in July 2018 to oversee US Lacrosse approved training of women’s game officials in Northern California and assign officials to NCJLA and CIF women’s games. Don’s involvement in lacrosse leadership extended to national level service starting with the US Lacrosse Regional Operations Committee and various ROC sub-committees in 2013 with him assuming the chair role in 2016. Since then, he has served on various task forces and sub-committees in support of streamlining US Lacrosse’s committee and volunteer structure, improving chapter operations and bringing greater value to its members. He has been a frequent presenter and panel member at US Lacrosse National conventions. He has been a US Lacrosse National board member since September 2016 and has been the Membership Committee chair since September 2017 and has general oversight on its sub-committees - Chapter Effectiveness & Lacrosse Organizations. Don and his wife of 37 years, Lynn, have three adult children who all played youth lacrosse. Don and Lynn currently reside in Davis, CA. Paul Kunzel saw his first lacrosse stick in 1978 when some crazy guy from Long Island showed up at his High School in San Diego driving a Harley Davidson and looking to start a new team. Paul played two years at Point Loma High School, serving as a Team Captain his senior year. In 1979 Paul headed off to UC Santa Barbara where he started on Defense all four years. In his years at UCSB, The Gauchos won two Western Collegiate Lacrosse Championships and Paul was a Team Captain for both his Junior and Senior seasons. Paul is also a member of the UCSB Lacrosse Hall of Fame. After his college career ended, Paul went on to teach Mathematics and coach Lacrosse at The Dunn School in Santa Ynez, Ca. 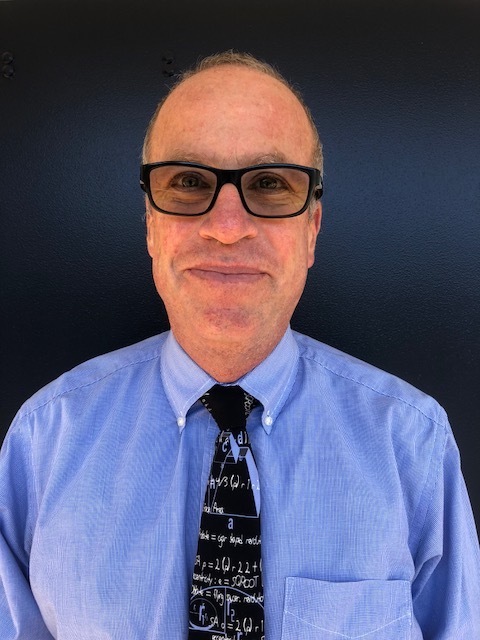 Paul was married to his wife Karen in 1988 and together they moved down to Los Angeles, where Paul taught Math at Brentwood College Prep and was Head Lacrosse Coach at UC Los Angeles. It was 1993 when Paul ventured up to Northern California. Paul and Karen (and their two sons) have lived in San Jose ever since. During these last 25 years, Paul has coached Youth Lacrosse and been awarded the “Double Goal Coach” award by The Positive Coaching Alliance. Paul first started Officiating Lacrosse in 1994, and he has officiated in the Professional Leagues (MLL and NLL), Collegiately (NCAA Div. 1,2, and 3, and The MCLA), and in the High School and Youth leagues. 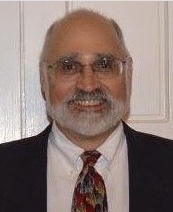 Paul has also served as a NCLRA Board Member and he is currently on the US Lacrosse Training committee. While Paul is a deserving 2018 Hall of Fame Member for his officiating, he has probably left his biggest mark in Training Officials all over Northern California. Paul (NCLRA Training Coordinator) sets the curriculum and coordinates all Lacrosse Officials Training in Northern California. He also helps design curriculum for the whole US (as a member on the USL Training committee). Paul’s passion for the game is very evident and his eagerness to “give back to the game” is much appreciated not only in Northern California but across the whole United States. Matt Ogelsby was born and raised in the Philadelphia area. He attended The Haverford School for 12 years and graduated from The Lawrenceville School in New Jersey, 1991, where he was named All American, received the school’s best athlete award and led his lacrosse team to the state private school championship. When Matt was a senior at L-ville, top national college lacrosse programs generally ignored talented players from areas other than the traditional lacrosse hotbeds of Baltimore, Long Island, and upstate New York. Matt chose to go to Duke University. Hardly considered a national power at the time, Duke was ranked #15 nationally. When he graduated in 1995, Duke was ranked #4 in the country, won the ACC Championship for the first time in program history, and was respected as one of the up-and-coming national programs. (Duke went to its first NCAA Final Four in 1997.) At Duke Matt was a 3x All American, 3x All ACC and named ACC Player in 1995 the first Duke player to receive that honor since the 1950s. After graduation, Matt made what would prove to be a life-changing decision. A friend from NorCal, Mario Enea, whom he met at the North-South All-Star game in 1995 and with whom he played box later for the Charlotte Cobras, influenced Matt to head west in 1996 “to check out the best coast”. 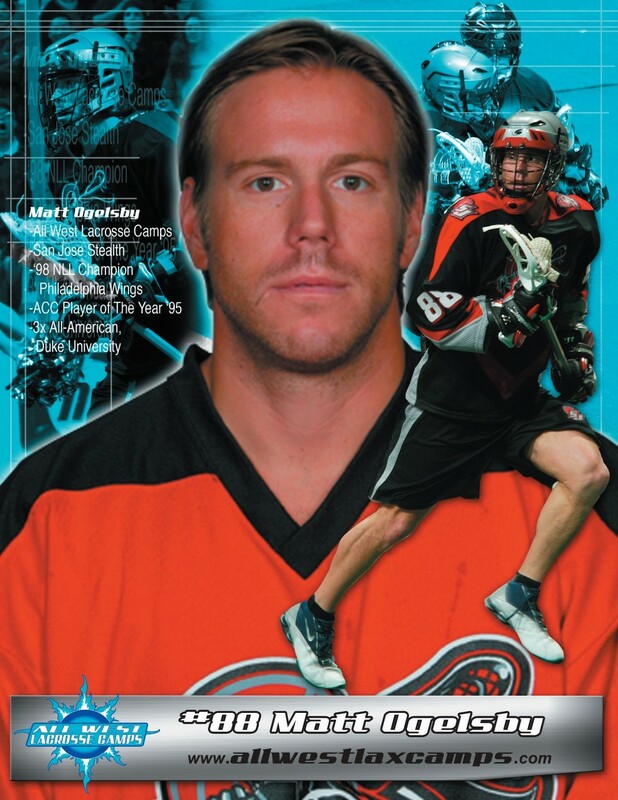 From 1997-2000 Matt played professional box lacrosse for the Philadelphia Wings and won the league championship in 1998 and Matt was named co MVP of that team. Every summer Matt would go back to NorCal to coach lacrosse. Then in 2000, Matt made the move to San Francisco. He’s been here in the bay area ever since. Prior to coming to CA, Matt had successfully run lacrosse camps on the east coast, more as a sideline than occupation. (In fact, Matt held the very first Nike Lacrosse Camp in the country at his alma mater, Lawrenceville.) He took that knowledge and ability to CA and decided to make it his life’s work. After successfully running camp programs for Nike and then STX, Matt decided to start his own lacrosse business with his father, Charlie, in 2003. They started Matt Ogelsby’s All-West Lacrosse Camps (a/k/a All West Lacrosse). Over the years, All West Lacrosse expanded vastly, offering not only summer camps, but elite teams, travel teams, indoor and outdoor lacrosse leagues, private lessons, pre-kindergarten programs, tournaments, and after-school programs. All this was started while Matt played professional box lacrosse with the San Jose Stealth and field lacrosse with the San Francisco Dragons and the LA Riptide. In 2009, recognizing the need to involve underserved communities in the NorCal lacrosse world, All-West created The RAE Foundation. Matt raised thousands of dollars privately and committed a portion of camp proceeds to be donated to the foundation to provide the necessary funds to allow underserved youth to learn about and enjoy the great game of lacrosse. In his 22 years of coaching Matt has trained and counseled tens of thousands of CA players and, with his east coast lacrosse contacts, mentored some into top D1, D2, D3 and club collegiate programs. It was natural for him, then to become Head Lacrosse Coach at Marin Catholic High School which won three NCS Championships and two MCAL Championships in the four seasons he coached.